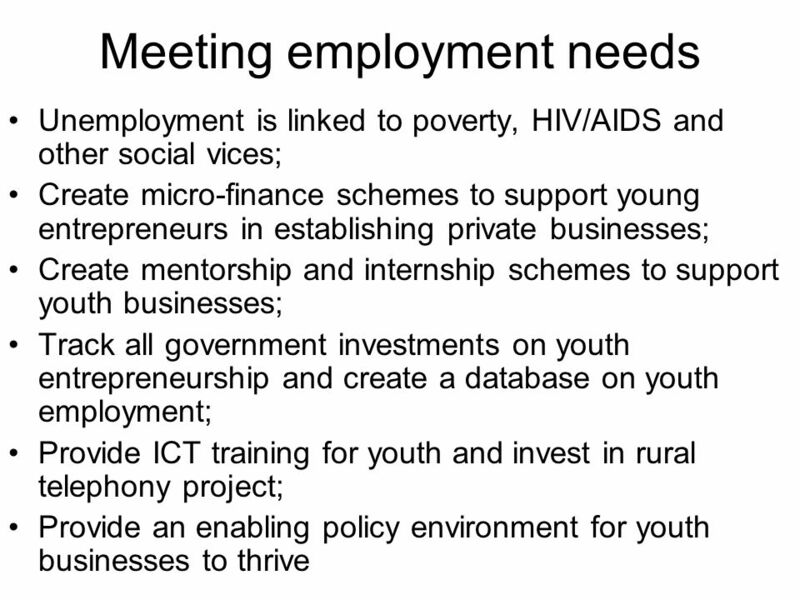 Integrating the needs of young people into the Second National Economic Empowerment and Development Strategy (NEEDS 2) Dabesaki Mac-Ikemenjima Representative. 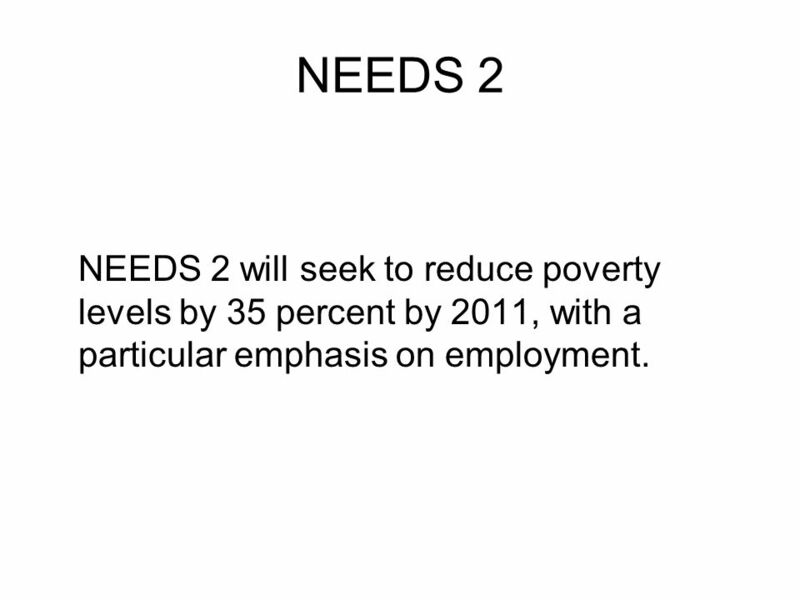 3 NEEDS 2 NEEDS 2 will seek to reduce poverty levels by 35 percent by 2011, with a particular emphasis on employment. 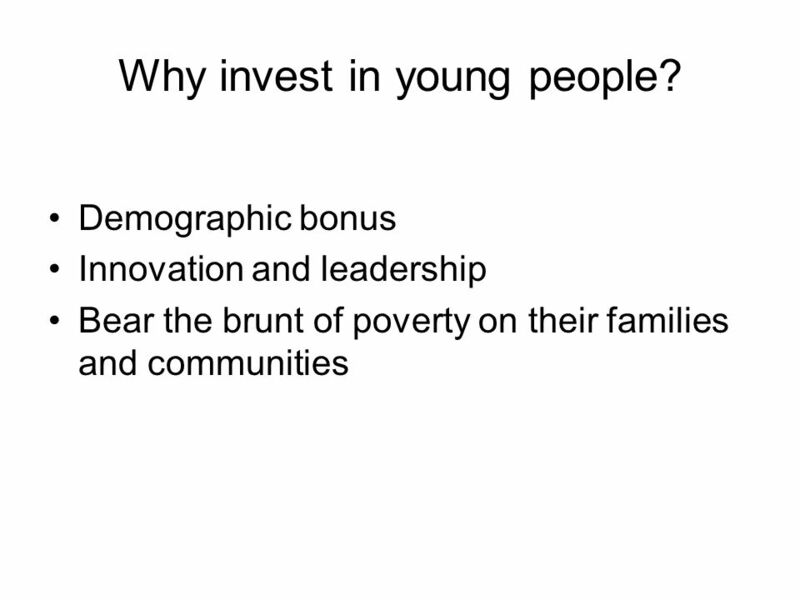 5 What do young people want? 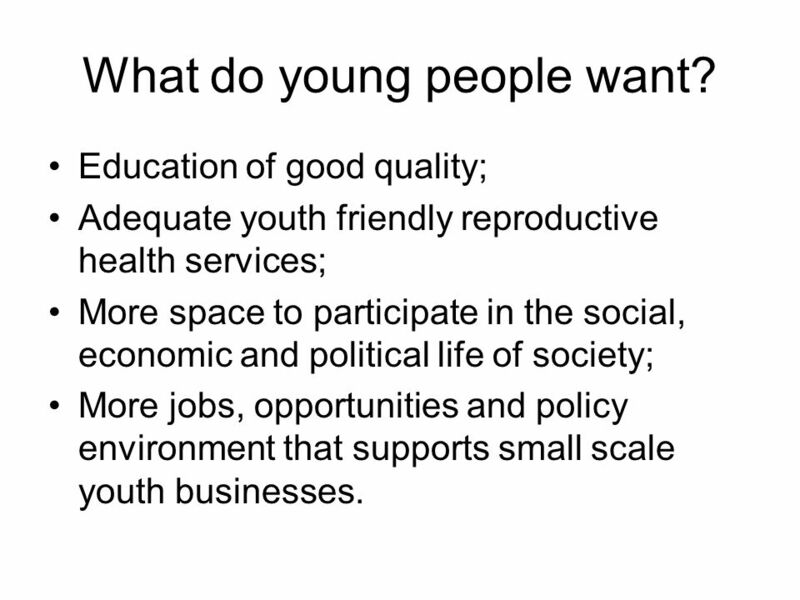 Education of good quality; Adequate youth friendly reproductive health services; More space to participate in the social, economic and political life of society; More jobs, opportunities and policy environment that supports small scale youth businesses. 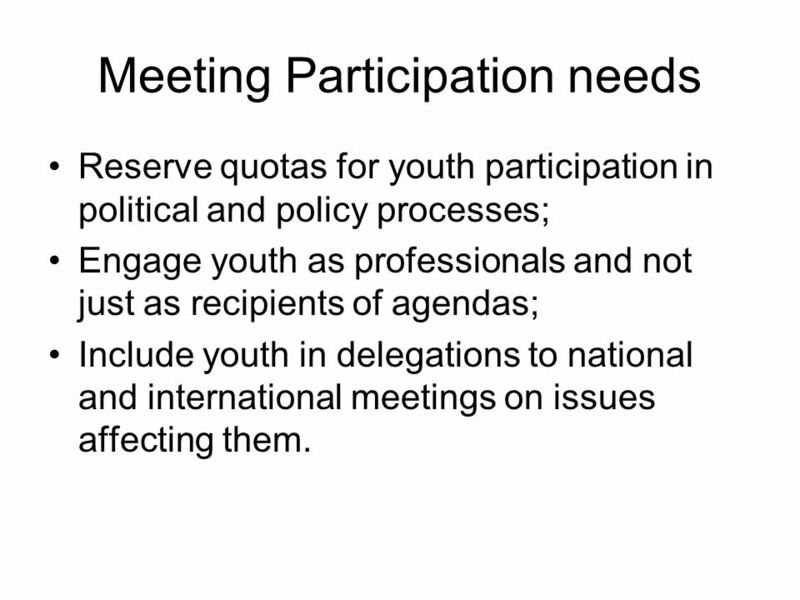 7 Meeting Participation needs Reserve quotas for youth participation in political and policy processes; Engage youth as professionals and not just as recipients of agendas; Include youth in delegations to national and international meetings on issues affecting them. 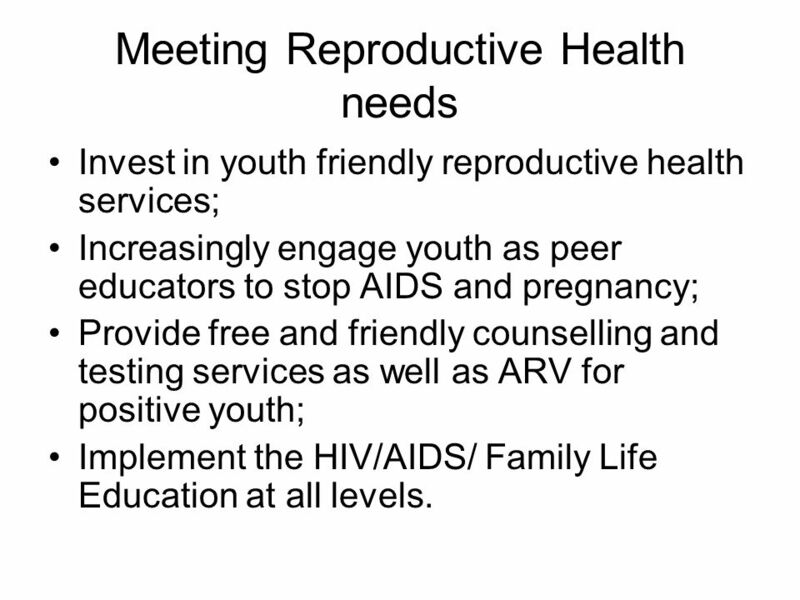 8 Meeting Reproductive Health needs Invest in youth friendly reproductive health services; Increasingly engage youth as peer educators to stop AIDS and pregnancy; Provide free and friendly counselling and testing services as well as ARV for positive youth; Implement the HIV/AIDS/ Family Life Education at all levels. 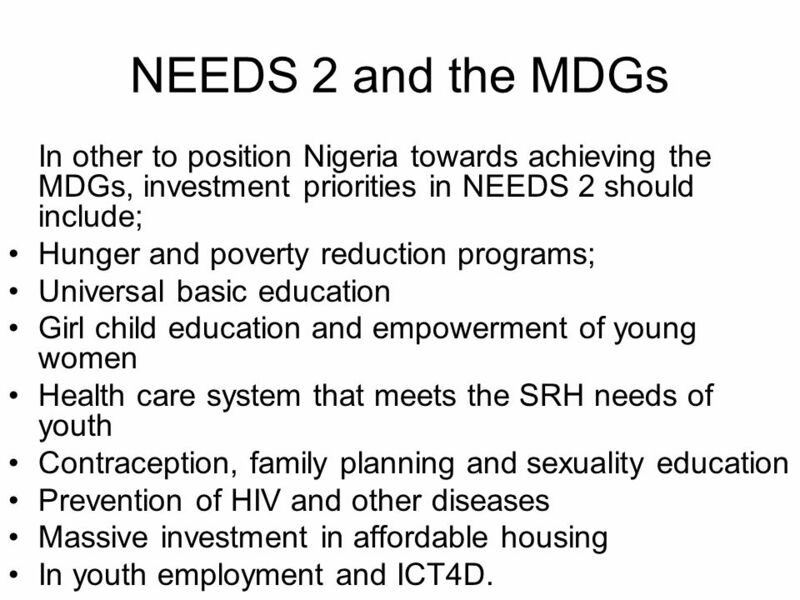 11 NEEDS 2 and the MDGs NEEDS 2 will seek to reduce poverty levels by 35 percent by 2011, the MDGs seek to halve poverty (50 percent) by 2015; Achieving NEEDS 2 is critical to Nigeria’s achievement of the MDGs. 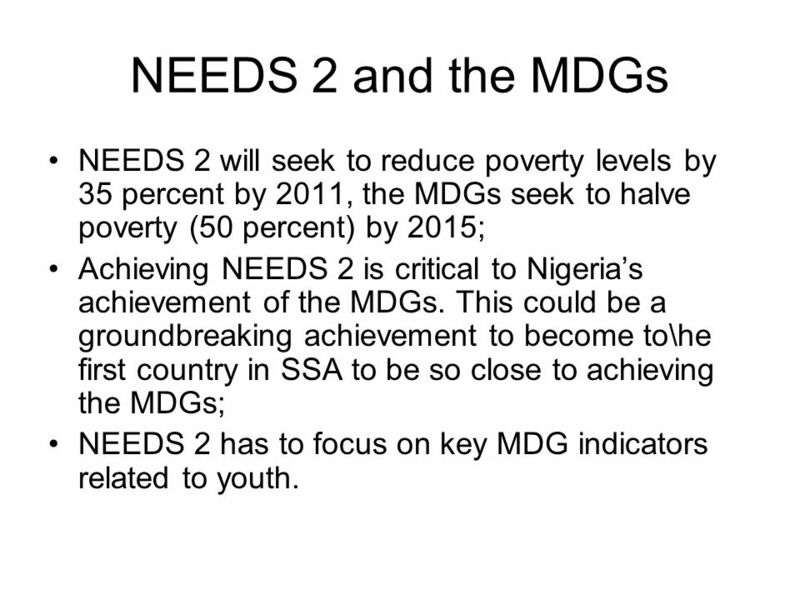 This could be a groundbreaking achievement to become to\he first country in SSA to be so close to achieving the MDGs; NEEDS 2 has to focus on key MDG indicators related to youth. 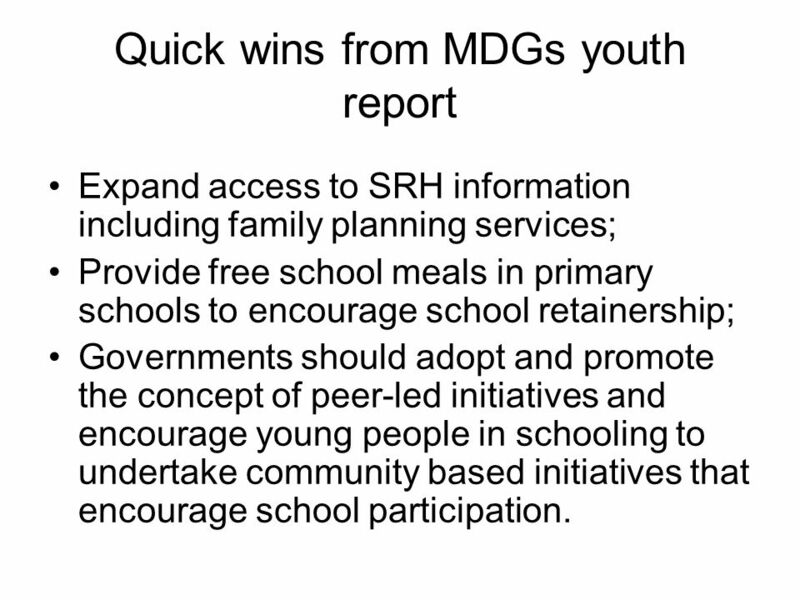 12 Quick wins from MDGs youth report Expand access to SRH information including family planning services; Provide free school meals in primary schools to encourage school retainership; Governments should adopt and promote the concept of peer-led initiatives and encourage young people in schooling to undertake community based initiatives that encourage school participation. 13 NEEDS 2 and the MDGs In other to position Nigeria towards achieving the MDGs, investment priorities in NEEDS 2 should include; Hunger and poverty reduction programs; Universal basic education Girl child education and empowerment of young women Health care system that meets the SRH needs of youth Contraception, family planning and sexuality education Prevention of HIV and other diseases Massive investment in affordable housing In youth employment and ICT4D. 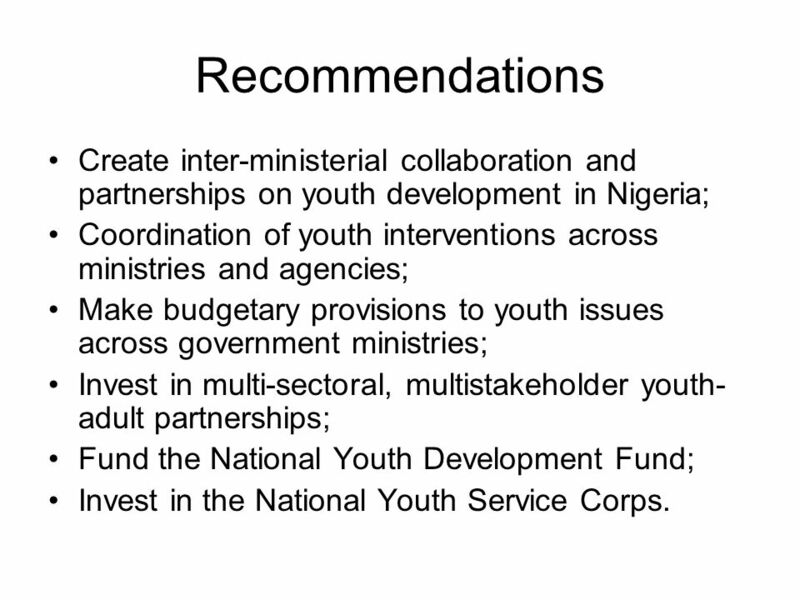 14 Recommendations Create inter-ministerial collaboration and partnerships on youth development in Nigeria; Coordination of youth interventions across ministries and agencies; Make budgetary provisions to youth issues across government ministries; Invest in multi-sectoral, multistakeholder youth- adult partnerships; Fund the National Youth Development Fund; Invest in the National Youth Service Corps. 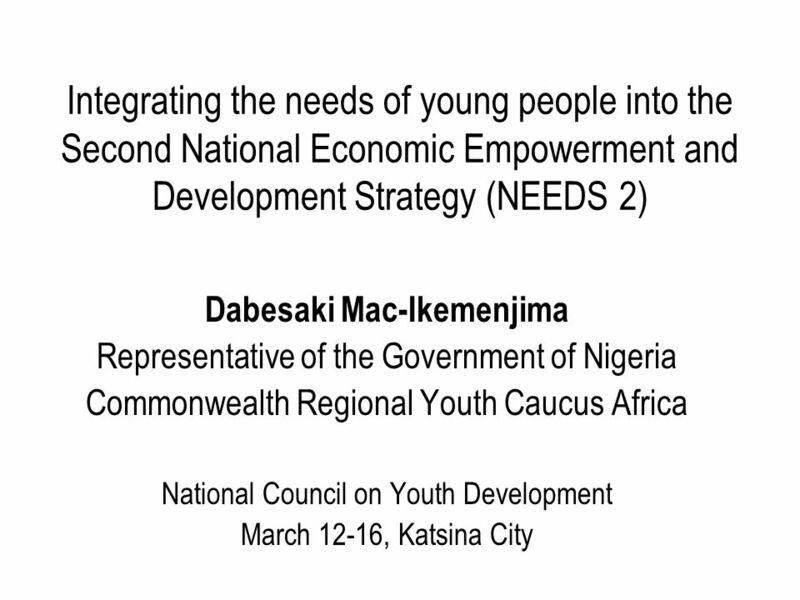 Download ppt "Integrating the needs of young people into the Second National Economic Empowerment and Development Strategy (NEEDS 2) Dabesaki Mac-Ikemenjima Representative." MDG Needs Assessments. 2 Overview of the Millennium Project Mission: –To develop an operational framework that will allow. Disaster Risk Reduction and Governance. Ron Cadribo. NEEDS Costing and Prioritization Costing a NEEDS Assessment. Water seminar Brussels, July 2010 Water, sanitation and the other MDGS A. Liebaert, DG DEV/B/1. February 2006 WHO's Contribution to Scaling Up towards Universal Access to HIV/AIDS Prevention, Care and Treatment Department of HIV/AIDS. EDUCATION FOR ALL – A RIGHT ? 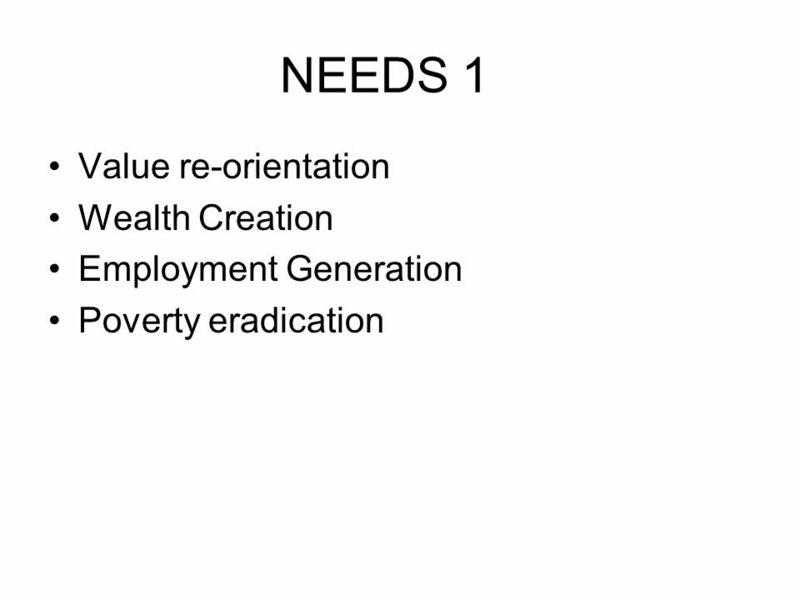 Beyond MDGs: an African perspective Abebe Shimeles, Principal Research Economist Department, African Development Bank. 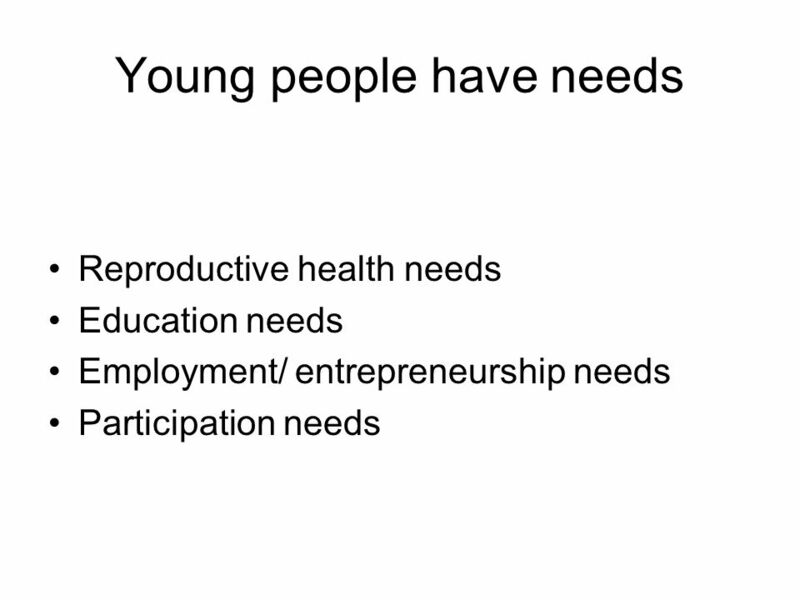 NEEDS 2 AND YOUNG PEOPLE IN NIGERIA: JOURNEY SO FAR Nigerian Youth Network on MDGs Development Partnership International. Dorotea Daniele, Facilitator. The members Polish Ministry of Regional Development ESF Council in Sweden Lombardy Region Ministry of Labour and Social. Process and Recommendations. I. 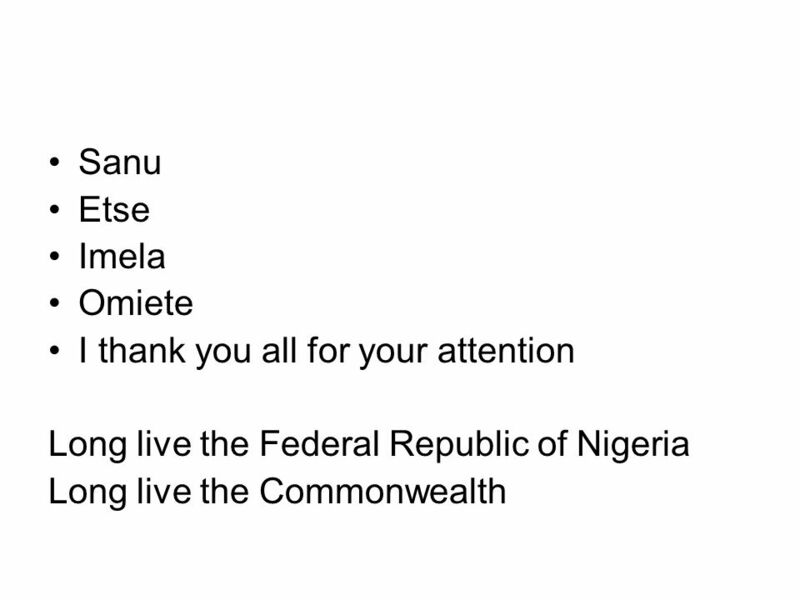 Introduction II. Process III. Key Achievement IV. Recommendations. Sushil Ram CYP Pacific Centre. Pacific regional Conference on “Investing in Youth Employment” Held in Port Vila Vanuatu 45 key stakeholders working directly.